(Newser) – Washington is putting its foot down—or at least asking Britain to put its foot down—over alleged shipments of attack helicopters to Syria, the Telegraph reports. US officials have enlisted Britain to stop a Russian ship from delivering its cargo to Syria, by having the ship's insurer, based in London, withdraw its cover. Then the Russian-operated cargo ship, the MV Alaed, would find it hard to legally dock in most ports and may have to return home. Ah...isn't this much like the US military's abuses and murders of innocent civilian, women and children that occur on a daily basis around the planet. 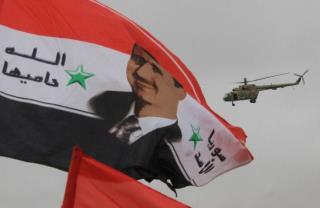 Isn't the syrian government much like the Israelis as well as the US? Illegally butchering innocent women and children...how about we stop sending Fascist Israel money and weapons and technology, get out the countries the we have illegally invaded...and rather try to support the people who we and these other governments have butchered. you can't do it in one country and not in the others who has suffered the same type of horrors. been there, seen it... I have documented the abuses of the Israelis and the US military forces against these innocent civilians, pix in the Hague so that one day when the US and Israel start to respect international law, their solders and governments will be held to account like those from Bosnia, etc who have been tried there and ground guilty. Thats pretty funny. The USA telling somebody else to tell somebody to stop selling weapons. cough eric holder cough cough HRC is worse than nobody at all. sheesh. P.S. That is an especially nasty pic of HRC. Strange choice considering how much Newser worships her.